As the new year kicks off many schools are starting their application processes or are already in the midst of it. Language Immersion Schools are very sought after these days and its advisable to send in your application as soon as possible, or at least get your name on the waiting list. If you have in mind for your child to attend a German language immersion school make sure you find out if there is a separate application procedure for native speakers. At some immersion schools native speakers might have a slight advantage and a better chance to get a space since the school needs to have a certain percentage of native speakers to offer a well-functioning language immersion program. Apart from January’s application season many schools host also open houses for parents and students to check out their program and to see if it’s the right choice for them. It’s nice to see that some parent groups are really active out there and engaged to keep German language programs going. One of these schools that can call itself lucky to have such an engaged parent volunteer body is the Franklin Magnet School in Glendale. 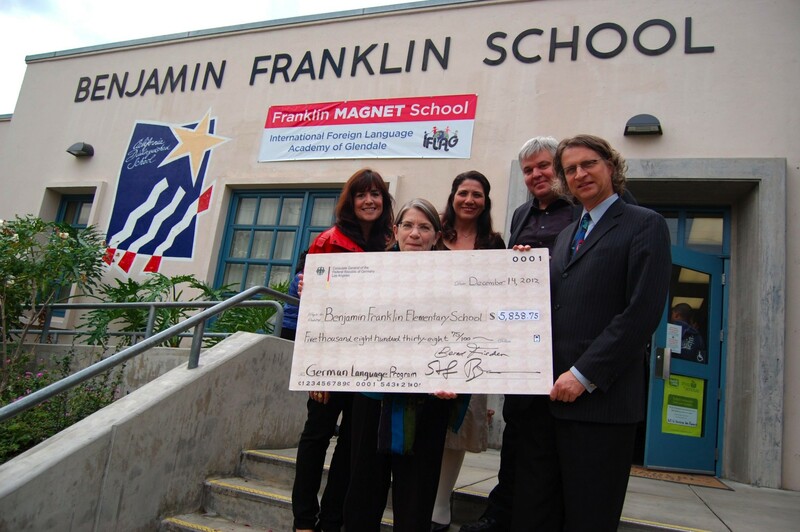 Franklin Magnet School – The International Foreign Language Academy of Glendale is offering several language immersion programs, German is one of them. Before the holidays the school had the honor of German Deputy Consul General Stefan Biedermann visiting the students and presenting them with a check of nearly $6000 to support the German language program. Anyone who is interested in applying to Franklin Magnet School’s immersion program is advised to send in applications immediately. The cut off date is January 25 at 4:30pm. IF YOUR CHILD SPEAKS GERMAN, SCHEDULE A TIME FOR THE EXAM! WHERE: GUSD Magnet Office at 223 N. Jackson St., Glendale, CA 91206, PH:(818) 241-3111 ext 649. Applications MUST be RECEIVED by the Glendale Unified School District (GUSD) by January 25 at 4:30 p.m. ! Orange County International Academy (OCI Academy) in Ladera Ranch has been introduced in our previous article on German Schools in CA. The school opened its doors not too long ago, and because of the high demand in its various immersion programs established a popular German immersion program in South County for grades Pre-K to K.
GISSV – German International School of Silicon Valley offering a bilingual education from Preschool to University opened up a new campus in November 2012. 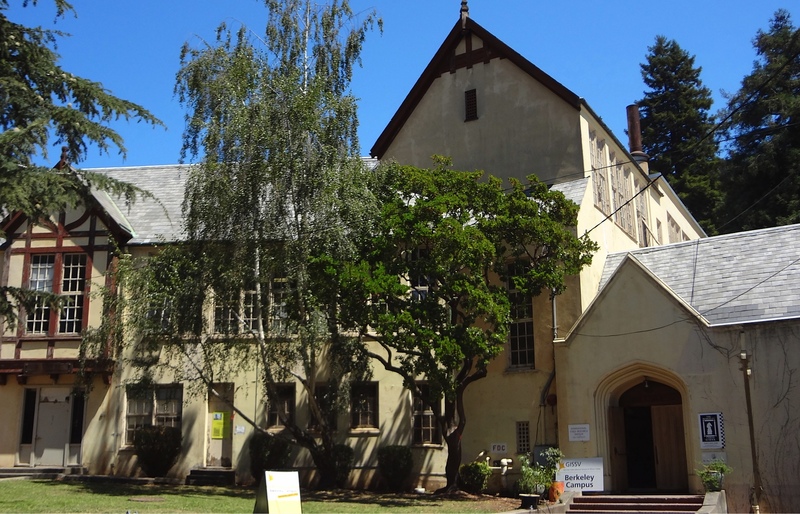 The historic Hillside School of Berkeley became the school’s 3rd campus in the San Francisco Area. GISSV, which is accredited by the Western Association of Schools and Colleges” (WASC), offers the German International Abitur (DIAP), and the CA High School Diploma, which qualifies students for acceptance into European and American universities. “The GISSV Berkeley campus, currently housing a mixed-age Kindergarten and grades 1 through 5, to be extended through grade 8 over time, is honored to make its permanent East Bay home in Berkeley.” The Grand Opening Ceremonies were quite impressive with theGISSV Orchestra, performing “Music for the Royal Fireworks” by George Frideric Handel. Every Tuesday from 9:30am to 10:30am during our enrollment season. Please contact admissions@gissv.org to register (registration required). The German American International Schools (GAIS), another German immersion School in Silicon Valley which offers preschool through 8th grade, has an information night on all sections of the school on January 8th at 8pm . The deadline to apply to the German American International School is already on Jan 14, 2013 (for new students only). To read their latest news, check out their online magazine .